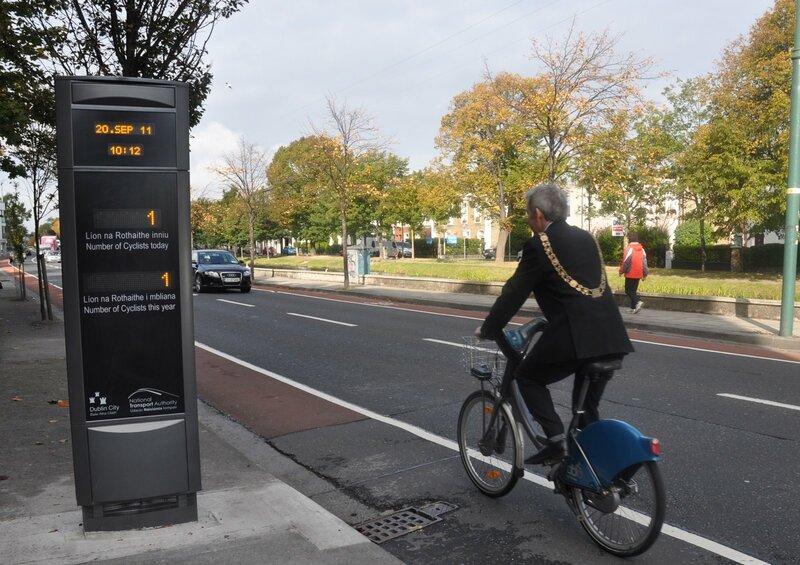 Dublin City Council launched its first automated bicycle counter last week as part of European Mobility Week. It is part of a planned network of counters funded by the National Transport Authority (NTA). The counter launched yesterday along the Grand Canal between Harold’s Cross and Rathmines, and another near UCD on the N11 installed at the start of the year, cost around €20,000 each. The main cost is the tall on-street units which have electronic displays built in showing the numbers of cyclists passing them daily and yearly. The counter at the Grand Canal also shows the time and air temperature. Dublin City Council is looking at installing another counter unit on the north side of the city, while Dún Laoghaire-Rathdown County Council also plans two more, one at Clonskeagh Road at UCD and the other on the Rock Road at Booterstown. The trial also includes counting locations without the display units which are a fraction of the cost. One of these is currently installed on The Metals walking and cycle route in Dun Laoghaire, while another is planned for the N11. Over 1,250 cyclists passed by the counter in its first 24 hours, between 10am on Monday and Tuesday, before it was reset for a photoshoot with the lord mayor. The counter uses electromagnetic inductive loops in the road – the sensors which are also used at traffic lights can tell the difference between cyclists and other traffic. The information is relayed to Dublin City Council’s traffic control centre. Ciarán Fallon, the city council cycling officer, said the counters act as a useful tool for planning and promotes cycling. He said he does not think motorists will “suddenly hop out of their cars and walk into the local bike shop” but that the counter unit would be an encouragement for all passing it. He said if €10 million a year was spend on cycling every year the city could “easily” double or triple the amount of cyclists. Also to mark European Mobility Week, the council plans transform Dame Court in the city centre into an “urban park” with Astroturf. The street will be closed to traffic on Thursday. Dún Laoghaire-Rathdown County Council said so-far this year just under 82,000 cyclists passed its counter on the N11. That counter had a daily peak of 760 cyclists but an average of only 312.